Bar Style Deep Sink Strainer fits 1-7/8 to 2 1/2 openings. Constructed out of Stainless Steel and Chrome Plated gives you a great choice for your next kitchen plumbing project. Recommended for Bar or Prep Sink Applications. Comes with a Deep pattern to give it a fascinating look in your Kitchen or bathroom. It Also includes Washer & Nuts. It prevents unwanted debris and foreign objects from slipping down the drain. 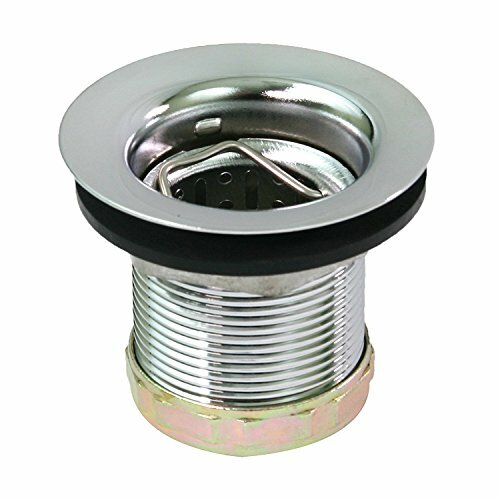 HIGHLY DURABLE: The Bar Sink Drain Assembly is made of Stainless Steel which is built to last! FITS BAR OR PREP SINKS: 1-7/8" - 2-1/4" opening , Will work for Laundry sinks as well ! If you have any questions about this product by Everflow, contact us by completing and submitting the form below. If you are looking for a specif part number, please include it with your message. Dearborn 16 Sink Basket Strainer, Brass Body w/ Stainless Steel Basket. Heavy Locknut. Rubber Stopper. Length-3-3/4"